LOVE's Haven: Eat Beans, Weigh Less? They’re called "magical fruit" in children’s rhymes for a reason . .
Just not for the flatulence-producing reasons kids obsess about. What really makes beans magical is their potential effect on your waistline: Bean eaters weigh less on average than non-bean-imbibing folks do. 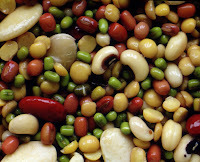 In fact, bean eaters weigh as much as 6.6 pounds less. It makes sense when you consider beans are full of fiber and protein but low in fat, which means a serving will keep you going far beyond the need-to-munch hour but only make a minor dent in your calorie intake.